I had big plans, big goals for 2014. Back in January I set my mind to run a 1:45 half marathon. I already had the half in mind – Brooklyn. What better half to achieve a huge goal than the half that started it all for me? Weeks rolled by and my training went well. Still about six weeks before Brooklyn, I knew that a sub-1:45 HM was too ambitious for the amount of training that I had put in. I recalibrated my goals to match my level of fitness: A goal: sub-1:47, B-goal sub-1:48, and C goal: PR. Three weeks before Brooklyn I became sick; one morning I woke up with a sore throat and the next day I was completely exhausted. When I get sick, I get really sick. There’s no such thing as bouncing back to health in 24 hours. I stay sick. Ben often claims that I’m the healthiest sickly person whom he’s ever met. It’s true. I don’t suffer from a major illness, but I do suffer with chronic minor illnesses. There are years where I was fully healthy for 3 or 4 months total. The rest of the time I was hit with sniffles, bronchitis, or something. I have chronic bronchitis because of asthma. For me, bronchitis is triggered by illness and allergies. As long as I’m vigilant about taking my medication for allergies as soon as I feel something, I’m fine. When I get sick, inevitably I get bronchitis. There’s no way to avoid it. The other problem is that the bronchitis last for weeks – a month at the very least and two months usually. True to form, although I felt better a few days later, I started coughing and I got bronchitis. Bleh! This really put a damper on my training. Along with the fatigue and stress from work (this year has been rather stressful and I’m so grateful that it’s over for now), having bronchitis meant that running was not particularly pleasant. The faster I ran, the more my bronchial tubes seized up. This eventually forced me to stop because of the lack of air. I had little interest in plodding, which was the only speed my body allowed me to do so I simply stopped running, except for the races that we had signed up for before I got sick. The excitement of the races served as a sort of balm for my irritated lungs. I ran faster than I would have otherwise in that state, but obviously I was running much slower times. I’m glad that I did those two 10Ks because they were the only running that I did three weeks out of Brooklyn. The week of Brooklyn, I had to revise my goals. Training had been completely derailed. I was excited to find out that for the first time, NYRR was providing pace groups fro Brooklyn and there would be a 1:50 pace group. I knew that I didn’t have the mental energy to keep myself on track for a 1:50, but I was hopeful that with a pace group, I would be able to keep up. I decided to run with the pace group for as long as I was able. If I felt really good, I would leave them a mile before the finish line. Now the A goal was PR, B goal was 1:50, and C goal was sub-2:00. The Brooklyn Half, in my mind, just gets better and better every year. I love the course of starting in Prospect Park and ending in Coney Island (in the past, it used to be in reverse). Ben loves the latest iteration of running first running around Prospect Park and then running inside. Some years ago, NYRR had the runners do two loops inside Prospect Park, which was terrible because the faster runners would lap the slower runners. The problem was made worse by the sheer number of runners and how crowded the race is, particularly in the beginning. Starting last year, NYRR turned the bib pick-up/expo into a pre-race party with bands, food, and exercise classes in a stunning Brooklyn waterfront location. I participated in the New Balance 4-mile fun run to the pre-race party on Thursday, May 15th. I was working from home that day, so I arranged my schedule to take the morning off. The fun run started from the New Balance store in the Flatiron District. New Balance provided bag check and gave a free t-shirt to all the participants. As I waited for the run to start, I noticed that one woman looked like Karla from Run, Karla, Run. Then my next thought was, “It’s more likely to be actually be Karla than someone who just really looks like Karla, but isn’t Karla.” She and I have been blogging friends for a while, but we’ve never met before. I tentatively asked, “Karla?” She turned her head and answered affirmatively. Before I could say anything else, her eyes widened and a look of surprise and recognition flashed across her face. We happily chatted about running and how nice it was to finally see each other in real life. She’s just as nice in person as she is through her blog. Karla was there to do some filming for her show, On the Run. The New Balance fun run was exactly that – fun. I ran near the front most of the time because I hate being in the middle of a pack or in the back. I was really impressed with Karla’s camera guy who did a lot of interval running. He sped up ahead of us to film us running towards him, and after we passed him, he sprinted back up to the group. 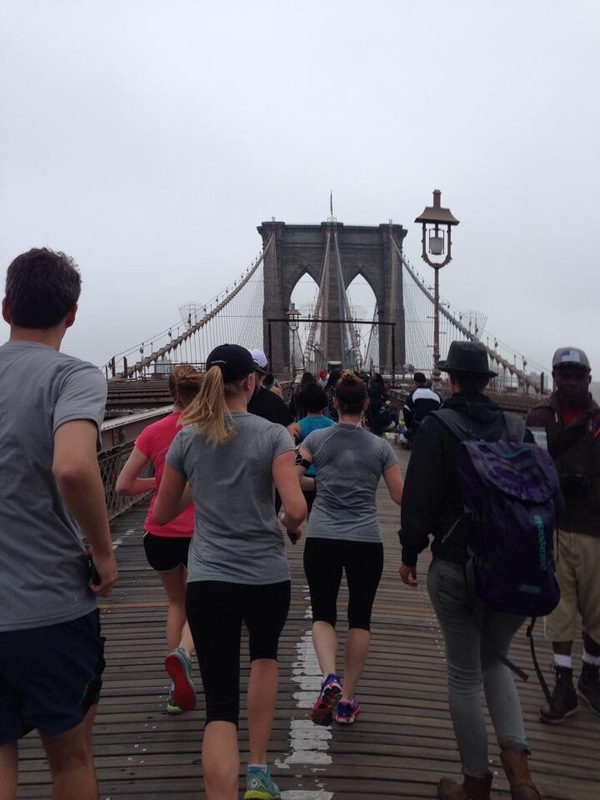 We ran through Manhattan and across the Brooklyn Bridge, one of the iconic symbols of New York City. Out of all the bridges in NYC, it’s definitely the most picturesque. 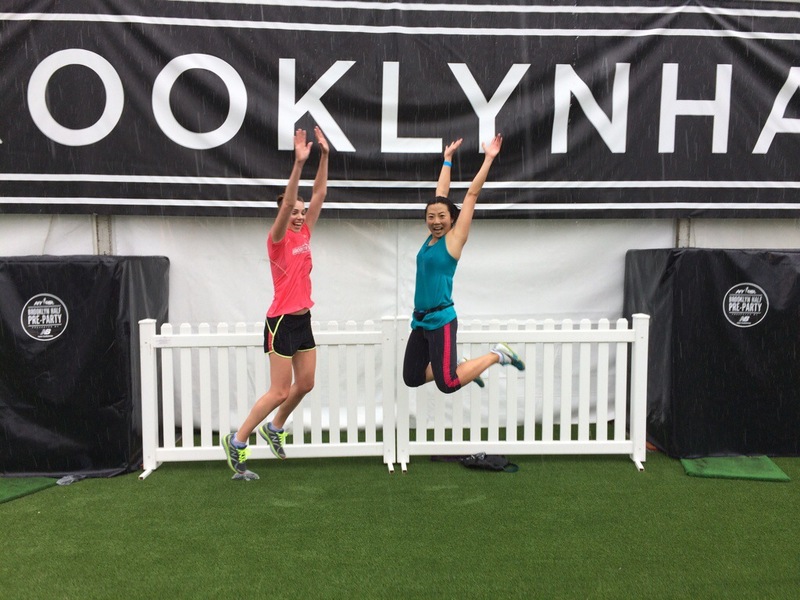 We ran through the newly created Brooklyn Bridge Park. It’s a beautiful waterfront park right by the Brooklyn Bridge. Just as we arrived at the park, it started to rain. We made it to the pre-race area in good time. It drizzled as we ran to Pier 2. As a part of the New Balance fun run, the runners got to pick up their bibs before the expo officially opened. While the bib pick up was really fast, this did mean that there wasn’t much gong on at the expo. The food trucks hadn’t arrived. There were no bands. No exercise classes. All these were scheduled for much later. I would have like to indulge in the fun, but I had to go home. *Forgive me for the giant photos. WP changed how you can edit photos and I can’t figure out how to reduce the size after you upload the photos. Scroll down to continue reading my post. There was a bit of excitement getting to the race Saturday morning. We looked at the PATH schedule to figure out the latest train that we could take. We knew we would be cutting it a bit close, but since we didn’t need to do a bag check, we didn’t need much time. Well, the PATH train, which is normally very timely, was over 10 mins late. This caused us to miss an earlier 2 subway train to Brooklyn. Now we were going to cut it really close. As we stood on the platform with other nervous racers in Wave 1, we ran into our friend from the running club and his wife. They told us that they were on an earlier PATH train than us that accidentally went in the wrong direction, which caused all the subsequent trains to be delayed. Finally the subway train arrived. Each car was already packed, but anxious racers crammed and wedged their way in. Train conductors ordered the runners to stop and to wait for the next train (which wasn’t coming for another 15-20 mins). Sorry, if we did that, then we’d miss the Wave 1 start. There was no way we were not getting in. We packed ourselves in like sardines. Unbelievably more people pushed their way in after me. I’m so glad that the train didn’t experience any malfunction and stopped because we would have all suffocated to death pretty quickly. There were other runners in the subsequent stations who wanted to get in, but honestly there was no way to fit another body. We lurched on to Brooklyn. The train became half empty when the Wave 2 runners exited to get to their corrals. Brooklyn Half is so large that there are two waves and several corrals in each wave. Runners in Wave 1 had a different subway stop. The entrance to the corrals was really close to the Franklin stop. We had to go through security and I even got wanded. I felt like I was at an airport. Ben was in the third corral, which he wasn’t happy about. NYRR seeds you by your fastest pace for any race that’s four miles or longer hosted by NYRR. That pace expires after two years. We don’t do many NYRR races, so Ben’s much faster time expired. I was in the 11th corral, but I went back to the 15th corral to be with the 1:50 pace group. Useful Brooklyn Half hint, the lines for the port-o-potties in the corrals get much shorter as you move up. The lines are impossibly long at the back of the wave. There was a bit of a delay to the start of the race, which I wasn’t aware of. I knew that as a later corral, I wouldn’t start right at 7 am, so I just assumed that the slow start was because I was in the back. The corrals were quite crowded. The excitement was palpable. Finally we were off. My plan was to stick with the 1:50 pace group for as long as I could. This was hard even at the start of the race because man, I’ve never been in a race as large as Brooklyn. There were over 25,000 racers. I had to run through a thick swarm of racers to try to keep up with the racers. I think even the pacers were a bit concerned about not letting the crowd slow them down because they were quite aggressive in fighting their way through people. I gave up any thought of running good tangents because there were just too many people. It was easier and less effort to run with the flow than to cut through to get the perfect turn. I enjoyed running with the pace group. I knew that if I had been by myself, I would have ran at a slower pace. I felt good and happy. The loud cheers from spectators and music and the pretty park make the first half of Brooklyn fun and exciting. Around Mile 5 there’s a long incline, which is the only major hill. It’s not steep, but it’s on the long side. Around Mile 7, you’re out of the park and it’s a long flat (slight downhill) run all the way to Coney Island. The second half of the race is quieter. There are fewer spectators. The last incline is going up the entrance to Ocean Parkway. At the top of the crest, you can see runners spilling out and running all over Ocean Parkway. It’s truly a sight — runners running freely all over the surface street of Ocean Parkway like water being sprayed out of hose. By this point, I was tired and I knew I couldn’t keep up with the 1:50 pace group. I started to let them go at Mile 6, with the thought that once we were on Ocean Parkway, I wouldn’t have to fight so many runners and I could catch up. Nope. The lack of running for the last three weeks took its toll on me. I ran what I could run. Once you hit Ocean Parkway, the wide street means that runners could spread out and it was less congested. But because the shade was on the left hand side and it was starting to get even warmer, we all ran on the left side except when there was a water station. Water stations were inexplicably on the right side of the street, which was annoying because you had to run an extra distance to get to the water station and then back to the cooler side of the street. I was really relieved when I finally reached Mile 13. I was tired and running with bronchitis isn’t easy. Just like two years ago, the sign letting me know that there was only 800 meters left excited me. I was going to survive. One last turn, up the ramp, and down the boardwalk to the finish. This year Ben found me as I ran down the boardwalk. I heard him call my name and I raised my hand to acknowledge it. Just a few feet in front of me was the glorious finish line. One of the things that I love, love, love about Brooklyn is the fun party atmosphere at the finish line. 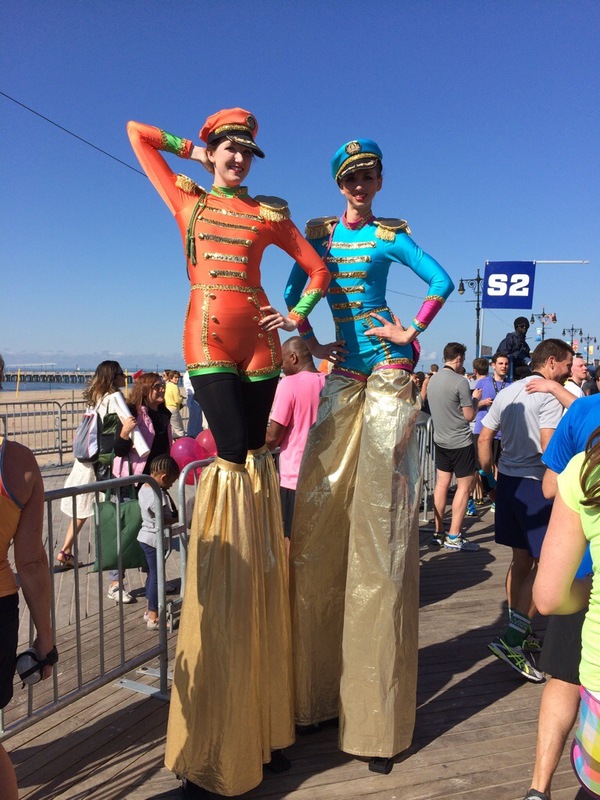 Runners literally take over Coney Island. Everywhere you go, runners are sitting, laughing, eating, drinking, and celebrating their accomplishment at the Brooklyn Half. At other races, I always felt like runners left pretty quickly after they were done. The only ones who stuck around are the ones who were waiting for their awards at the awards ceremony. This isn’t true at Brooklyn. We’re EVERYWHERE. On the beach! In the restaurants! Roaming the streets! It’s just an amazing experience being surrounded by people who just finished what you had done. It’s a happy jovial atmosphere. 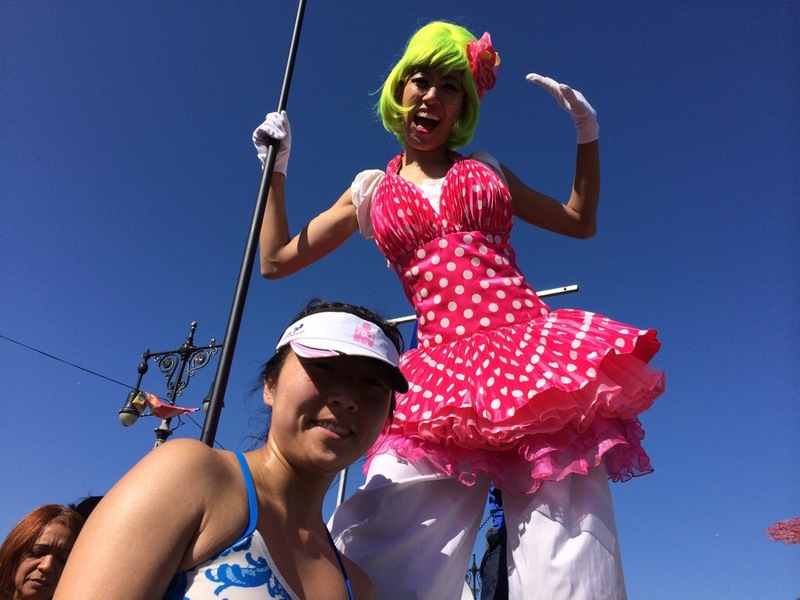 NYRR hired some performers on giant stilts to greet us at the finish line. I love them. I am not disappointed or sad about the 1:53:04 that I got at Brooklyn. It was simply the best that I could do that day given the circumstances of being sick and not fully trained. I can’t be disappointed about that. But I am sad over the fact that I did get sick. 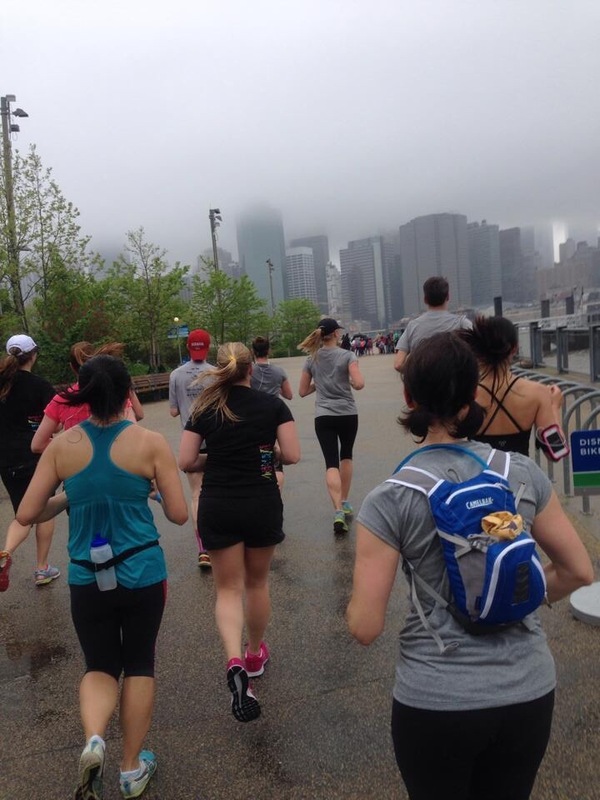 May 17th was a good day and Brooklyn HM is a PR-friendly course. I had put in several weeks of solid training beforehand and had a fantastic race at the Cherry Blossom 10-Miler, so I was really hopeful for a great time at Brooklyn. It wasn’t in the cards for me. I can accept this, but I am sad over the lost opportunity. I’m now focused on my fall half marathon training. I have a PR to chase. So sorry your sickness through you of course, but I think you did amazing. That’s a pretty decent race time for being sick. I don’t think I could even run if I was sick. What a cool race too. I like that folks stick around after the race (and I like your medal photo in the sand). Thanks. The medal photo is actually my friend’s. I thought it was cool too, so I took it. I couldn’t figure out how to do the captions while doing the post on the WordPress app on the phone. Nice going!!! I love the race- it sounds really neat!! You did an amazing job!!! Thanks! Brooklyn Half is a fantastic race. You should try to do it some time. Wow, your time is still impressive! I’m just getting over bronchitis and I can’t imagine running a half with it or while recovering from it. Still a great job! Thanks. It helped that I have a number of weeks of very good training. Congrats on a great race! Like you said, you did the best you could have done that day and you can’t ask more of yourself than that. It really stinks to be sick for a big goal race. I’ve been there. But it’ll just make you even hungrier for that PR! SO glad I finally got to meet you in real life. Super fun! It was great finally meeting you in person. Hope you see you around again. We should get Phil and Ben to run together. They’re about the same pace. Sorry you didn’t have an ideal experience, but way to fight thru it! I would love to run that race (as I’ve said). Congrats on running yet another half marathon!!!!! I was looking for Karla at the Dopey Challenge, but we never did meet up. Next time! Thanks. I had a good time overall. Karla is really nice and I hope you guys meet up one day. Great write up and congratulations! I think you did really well even though you were sick. 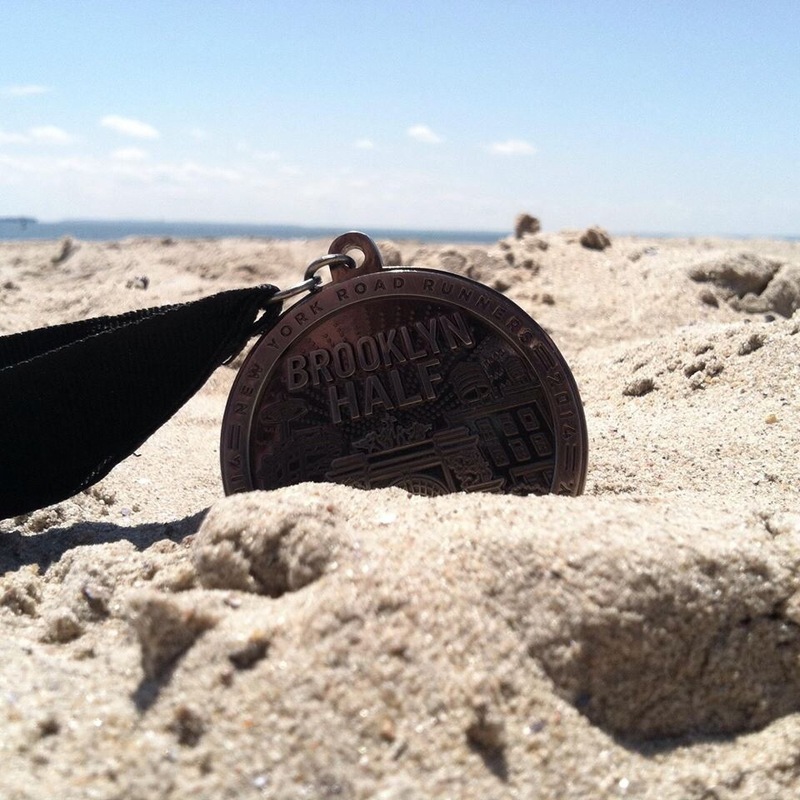 Your last two posts really make me want to run the Brooklyn Half. I may add it to my list. 🙂 Congrats again and hope you’re feeling better! Thanks. Yes, I am feeling better. I’m starting to enjoy running again, which is a good sign. You should totally do Brooklyn. The post-race atmosphere is the best that I’ve ever experienced. Great recap, I’m sorry you were not feeling 100% but it looks like it was a pretty fun race! It was really fun. It’s one of my favorites.